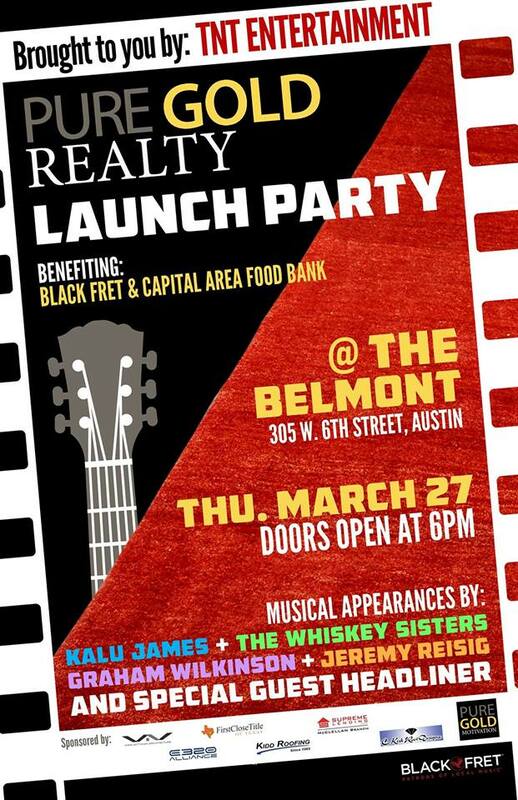 I will be DJing all night at The Belmont on Thu Mar 27th in between a slew of great bands. There’s Graham Wilkinson, Jeremy Reisig, Kalu James, Whiskey Sisters, Alpha Rev and myself. I’ll kick things off at 6pm and keep the party going until about midnight. The party celebrates the launch of Chad Goldwasser’s, Pure Gold Realty and benefits Black Fret and Capital Area Food Bank. No cover I believe. Come celebrate with us. This entry was posted in Shows and tagged ATX, Austin, Bands, belmont, black fret, DJ, goldwasser, Mixer, Party, pure gold, realty, Rogers, Show, Texas. Bookmark the permalink.